For a step by step instruction sheet for accessing our Online Databases, click on this PDF for screen shot pictures. 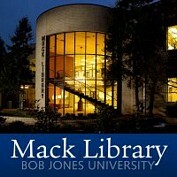 The Mack Library provides resources and services to students enrolled in BJU distance learning courses. Students in the greater Greenville area and who are in Greenville on a regular basis should visit BJU’s library to access resources and services. Electronic requests will be processed within two business days and shipped via UPS with tracking or other appropriate method. No charge for the first 10 pages. and then $.10 per page ($.20 duplex) thereafter plus $1.50 postage for every 12 pages or every part thereof. Shipping of items to the U.S. addresses is complementary (exception of rush shipping requests). Shipping fees to foreign addresses and for the return of library items is the responsibility of the student. Students may contact the library for specific shipping fees. Students may request a photocopy of a chapter of a book to avoid the additional expense and time necessary for shipping. Scanning an article or chapter and emailing as a pdf is available at no charge in limited quantities. Search the library catalog at http://libraryaccount.bju.edu. For assistance in searching, click on the help tab located at the top of each screen. Mack Library offers access to over one hundred databases. These databases can be accessed from the Online Resources list. Click the alphabetical link and then select the desired database. The BJU Central Authentication Service (CAS) will then request the student to enter their campus log-in. Should you experience a problem, contact the Reference Librarian at 864 370-1800 x6015. Here is a link to LibGuides that may be helpful in searching the databases as they provide instruction and searching tips. Distance Learning Students from the greater Greenville area should visit the Mack Library and check out books according to current student circulation policies. Other Distance Learning Students should request items through the Mack Library Interlibrary Loan Department by filling out the book request form. This is the primary avenue for borrowing books from Mack Library. Starts: The day books are checked out to the student and shipped. Ends: Ship books back to the library on or before the due date stamped on the date-due slip inside the front cover. Items not Loaned: reference works, audio visual materials, software, fiction or juvenile. The library reserves the right to not honor requests for rare or out-of-print items or books that are currently in high demand. Shipping: Arrival within a week via UPS Ground. Delivery to the student is paid by the library. Return delivery is paid by the student (return label included in shipment). Rush shipping: Items can be sent two-day air at the student’s request. The library will bill all special delivery fees to the student’s Business Office account. Please note that two-day air is about $10 a pound. Books shipped after the due date will be considered overdue and will be assessed a 50 cent per day fine. Books not received four weeks beyond the due date will be considered lost and the student will be billed for the replacement cost of the book, all overdue fines, and processing costs (currently $5 and additional fees for making a hardback from a paperback book). The lost book charges will be no less that $35 for each book. Please check the online catalog to verify we have the book. Fill out the book request form. If you have problems using this form, please contact InterLibrary Loan by phone [(864) 242-5100 ext. 6030] or email ill@bju.edu. We will process your request within two business days. Books should arrive within 7 to 10 days. Shipping method: The student is responsible for all shipping costs, both from the library to the student as well as from the student back to the library. Canada and Mexico:Items will be shipped by either UPS Ground or air mail, whichever is more efficient. Please consider using ILL whenever possible to reduce your costs. Other foreign destinations: Items will be shipped via air mail. Please contact the library for specific information. The library will immediately bill all shipping charges to the student’s business office account. We will e-mail you the approximate price to get your approval before shipping. Other Distance Learners should use their local public or academic library to borrow books from other libraries. Mack Library can not loan to Distance Learners books that we do not have in our collection. Articles: The Library will photocopy or scan and send up to five articles upon request from journals in the library’s current holdings and aren’t available through the databases. There are full text articles available to you in several of our databases. Copyright laws may prevent the library from honoring a request. If you require an article not located in our holdings simply request via Tipasa, InterLibrary Loan service. Books and dissertations: The library will photocopy limited portions of books or dissertations (no more than one chapter or 10% of the whole) upon request. Graduate students may request a copy of the entire dissertation. In addition to the above costs and at the request of the student, the library will have the dissertation bound as a hardcover for an additional $9. The library will send the pages to the bindery along with our regular monthly shipment. This process will lengthen the processing time by 6 to 8 weeks. Please check the online catalog for major magazines and journals to see if we carry that periodical. Do a title search on the journal title (not article title). Small religious publications mat not be cataloged; please send an e-mail to library_distance@bju.edu to check our holdings. Fill out the article request form by clicking Article on the book request form. If you have problems using this form, please contact Inter-Library Loan by phone [(864) 242-5100 ext. 6030], fax 864-232-1729, or email ill@bju.edu, and send the book information. LibGuides - This tool serves as a subject guide to resources in our library on a growing list of topics. Journal articles. Click on Full Text Finder on our alphabetical listing of databases. One can search this database for a journal title and by clicking on the database listing the title, one can then read the articles provided there in full text coverage. Research assistance. Contact our Reference Librarian 864 370-1800 x6015 or by email using Ask a Librarian.